Every couple of months, we come together as a group and analyze our menu, prices and items that we have in house. We try to look at things from a standpoint of price, efficiency, time, our ability to use up items and.......customer demand. After hearing request after request for the return of the green enchilada, we finally caved. We have everything in house to make this dish except for the the basil cream sauce. As we met during our last menu session, we also decided to make our own pesto sauce, which if we were going to keep basil here to make our own pesto sauce, why not just make the basil cream sauce as well. Coupled with your requests for this item, we decided to allow its return. I can not begin to tell you how many times our servers would inform us that their customers were asking for this dish, only to be disappointed that we did not have it on the menu & without the basil cream ready, it's not like we could "secretly" make this for someone. The dish that many have loved, and many more have missed, is back on our every day menu under the appetizer section. It is prepared as it always has been. 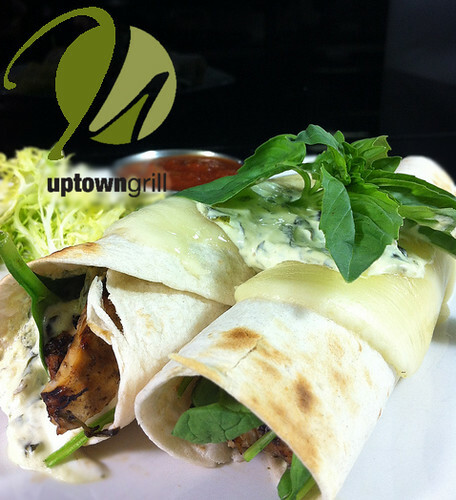 A fresh grilled chicken breast, rolled inside two flour tortillas with sour cream, provolone cheese, spinach and basil cream. An old Uptown Grill favorite has made a comeback. Don't miss out, cause when we meet about our menu again, if the sales don't meet the demand........we change our menu often! So happy this is back. Thank you!